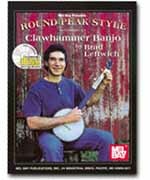 This book presents more than 70 tunes in the unique highly developed clawhammer style known as 'Round Peak' -named after the Blue Ridge Mountain, North Carolina community where it originated. While not intended for the absolute beginner, this book will benefit players at various experience levels. Tunes in the book are organized according to the specific banjo tuning used, with A and D tunings most prominent. Much of the book's commentary and the included CD recording is directed towards the fretless variant of the 5-string banjo but as these tunes are written in standard 5-string banjo tablature, they can most definitely be played on the more common fretted instrument. Includes tune lyrics and extensive historical and biographical notes plus technical tips and a discography. Written in 5-string banjo tablature only.